being out of 5x30 dominos i suddenly asked myself if it is worth making them yourself or not, so i took a piece of 43mm thick beech about 700x150mm big. planed and cut into strips, it gave me almost 1000 dominos! anyway, here they are, i planed blocks of 42x75mm, ripped them in half to give 18x75mm and ripped that to give 18x5mm strips (the size of 5mm dominos) and rounded over the edges on the router table. im thinking i will never buy dominos again, maybe even make future ones out of softwood aswell because beech is overkill in many situation. Any problem not having the glue groves? I know it looks scary GP but there's a gap between the fence and dominoes,it's a split fence.So they never fly about. its a wonder nobody has created a bit for making them. I make my own dominoes when I need a longer size (route the mortise with a router and an end mill), but I can't make a thousand of them in an hour. Economically, if Festool makes a domino the size I need, there is no justification for making my own. Here in the US they sell for about 17 cents a piece (more or less depending on size and quantity). I use ten of them in a chair that I sell for $800. Much better to spend my time making chairs instead of making dominoes. I was just thinking the same thing. I have had a few custom cutters made for my spindle and it would be easy to design one for the domino. Also If I had a domino and needed to make domino's i think sending through the drum sander for a final pass with 60 grit paper would really give them some good bite for the glue. Wayne, how is that drum sander working out for ya. Any niggles with it ? I make my own. I use the jointer to bevel the edges instead of rounding them over. The advantage to homemade is that you can make them in widths and lengths to match the different settings on the Domino and you can size them so they don't have to be pounded in with a hammer or extracted with vise grips. The fit the way a tenon joint should fit, snug but not too snug. I've made them myself for some shelving project where I needed them much longer (75mm). Hardest part was dimpling the logo in. I'd like to see a picture of that chair Jesse, sounds like it would be worth viewing! Buy the best, and learn to like it. That's interesting. I assumed that one would use Mahogany to replicate their own SIPO's. Is Oak just as suitably for water exposure? Are there other woods that others have used to make Domino's for outdoor use? In the past before tropical hardwoods became widely available Oak and Chestnut were used for exterior but untreated they are probably not as durable as Mahogany or Iroko.Having said that Chestnut fence posts seem to last an awful long time. I've used both Oak and Chestnut for making Dominoes usually for the widest setting. on some of the strips i routed small grooves length wise, but i gave up because it took too long. if there was a cutter available that could make many small grooves simultaneously, like sawtooth cutter for glue-ups then i would use it. i think length grooves would be better than the width grooves on the festool dominos, i think they tend to scrape the glue off the mortise, while length-wise grooves would at least leave glue where the groove is. The drum sander is working a treat, I'm not sure how i worked without it before. I only ever had one niggle when the sandpaper came loose during a sanding run. It basically destroyed the paper on one side by burning it. But it held together so im still able to use half the paper. If and when I get one I will have some custom cutters made that will both round them and cut steps into the round to create the grooves. A couple of passes with one of these will do the trick. In the old days (and in some cases today too), glue surfaces for veneers were prepared using these blades. Thanks for the kind words manpower. Here's a thread from the first time I made the chair that I now make with dominoes. I'm working on a couple of new designs: a cafe style chair based on a U shaped lamination and a Maloof inspired dining chair. I'm a little frustrated because the cafe chair just doesn't look right and the Maloof chair takes a huge amount of labor. I always intended to skim them lengthways with this but just never bothered. That is an excellent way to do it. I completely forgot that I have that blade. I will try it. I've made various sized Dominoes to suit the different jobs I needed. Heres a selection of some of the different sizes of done. Some of them are made to the #3 width setting and some are made wider to suit a 65mm rail. 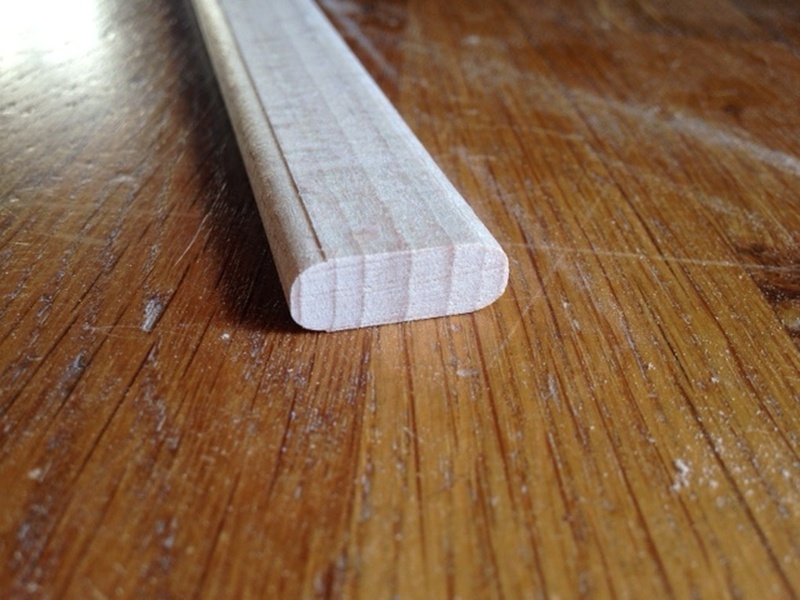 The long one is about 68mm long to suit a 20mm thick division in between 2 rails. Just chamferred with a 45 degree router bit with bearing all round. The grooves are done with a 45 degree router bit without a bearing (Comes to a point). This relieves the hydraulic lock and allows air aand excess glue to be squeezed out. That's more what I was thinking of as well. Something for glue to move around via the slottings you cut. Thanks for sharing! I agree with Jesse Cloud. I made 600+ 6mm x 40mm dominos out of a 5' pierce of beech. It took me about 6 hours, jointing, planing, routing and cutting them up. Based on the current price for a package of 190 at Amazon, l was working for little more than minimum wage here in the U.S.
Just go to YouTube. There are plenty of videos. I keep wondering when Woodpeckers is going to make an OTT to make your own dominos! When,,,,,,,, As soon as they do you will have a limited time to purchase it, wait an inordinate period of time. If successful, it will only be sold for a limited time, never to be made again. I was also interested in making my own domino. of course it is possible to use a somewhat smaller imperial bit which will make a small shoulder on the domino, but it may not be very esthetic for through domino. To make the grooves, it is easy to just press the domino in a vice with grooved jaws. Thanks for the reference. I've been using a slightly oversized quarter round bit to get the small point on the edge, and that works well for lightly wedging the domino in if you get the size just right, but it also takes two passes and a finicky setup. This looks easier - it would only take one pass.